I am listing this on ebay in a few days time so if you’d like to own a hard copy have a bid. Love the song myself and have two copies of the single, certainly not going to part with my original copy. Wow – maybe we could do a comeback gig at the Hexagon! Your single Sanctuary,is with out doubt one of favourite singles,so much so,I’ve got two copies of the 7″,record,just in case one gets damaged! I ‘m still looking for the 12″,which despite years of searching eludes me?With fingers crossed,on both hands,I don’t suppose you have a spare copy of the 12″,I could purchase?It would complete my vinyl collection & end a search longer than the one for the holy grail! 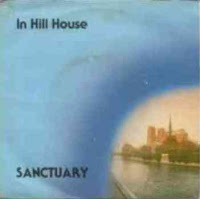 Hi Russell, as far as I remember there was no 12″ version of Sanctuary released, which would go a long way to explaining why you haven’t been able to find it!. However there was both a 7″ and 12″ version of the second single “True Life”.